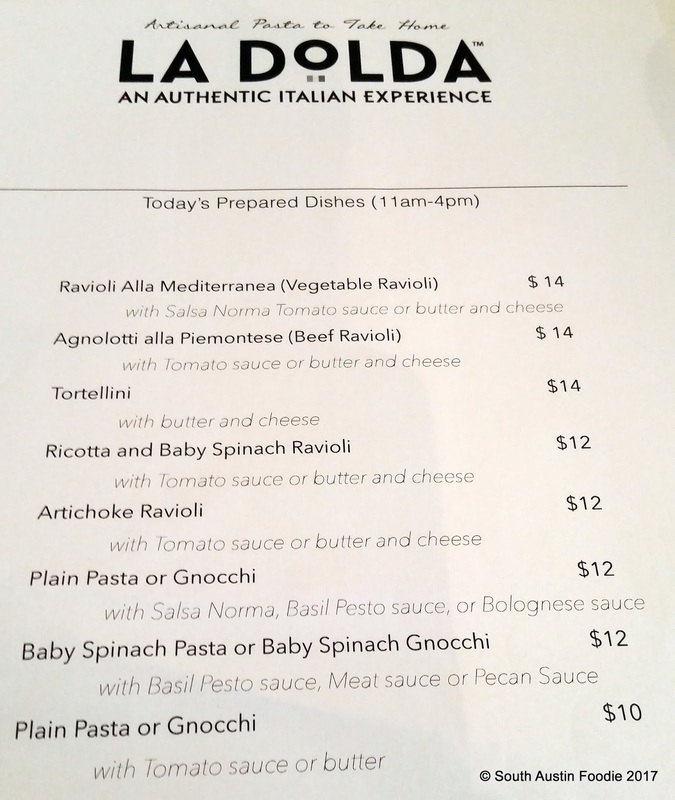 Editor's note: La Dolda closed January 2018. Only open since the third week of May, the word of fresh pasta is quickly spreading. La Dolda (Facebook page) is located at 4238 Bee Caves Road; as you are headed west on Bee Caves towards 360, they are on the right, just a bit past the light at Camp Craft Road. 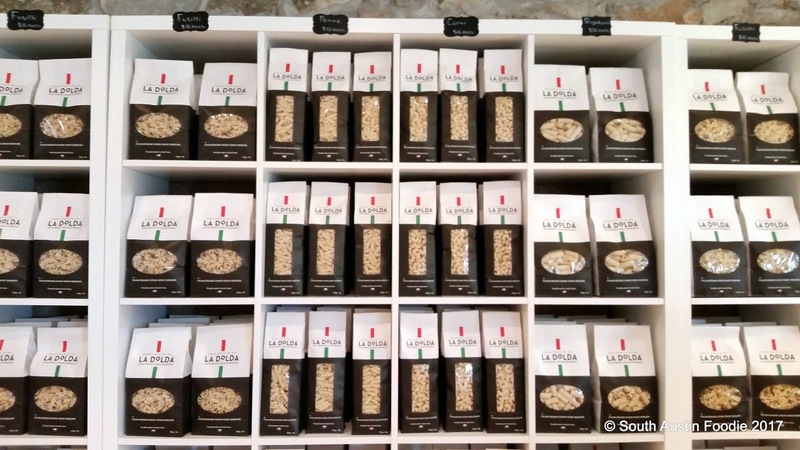 Inside, there are a few tables and fresh and dried pasta all around. 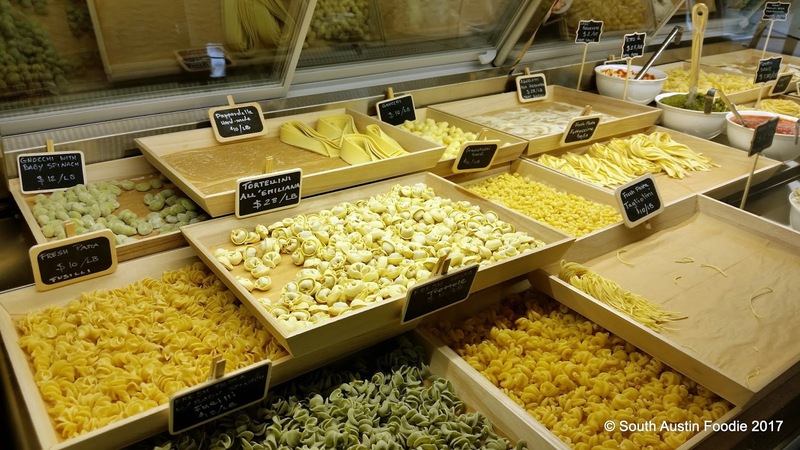 A nice glass case highlights the days offering of freshly made pastas, from the familiar linguine, tortellini, and raviolis to fun corkscrews and some tiny bean-like offerings. Plus a variety of sauces (pesto, ragu, pomodoro) to take home as well. Prices range per pound. 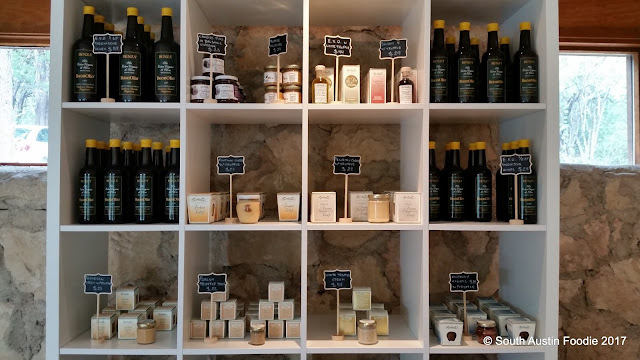 Two walls have shelving of nothing but bags of dried artisan pasta, and another wall had a big case of Italian condiments like balsamic vinegars and truffle oil. If you're there between 11 am - 4 pm, you can eat a meal there; here are some of the offerings. 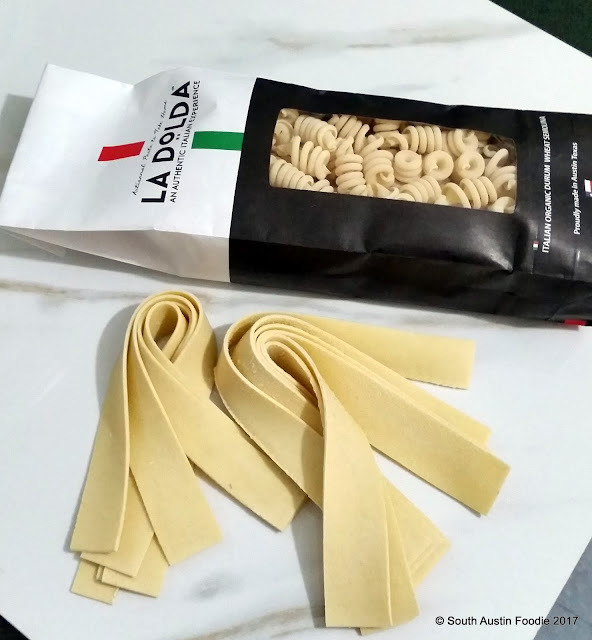 I got two different fresh pastas, plus a dried pasta as a birthday gift for a friend. 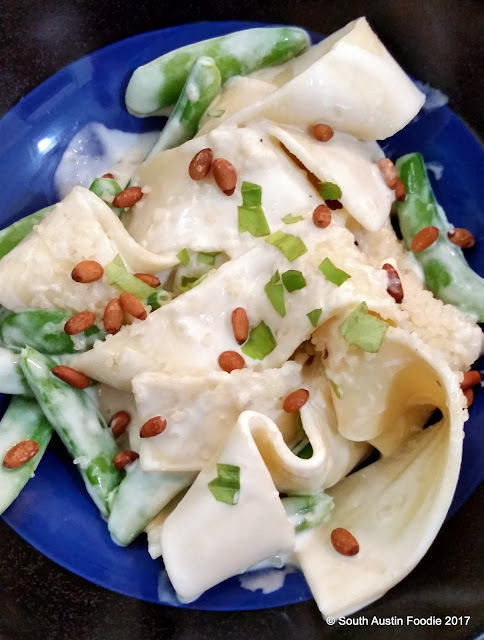 With the paparadelle, I tossed it with some mascarpone, fresh lemon juice, parmesan cheese, sugar snap peas, a bit of basil and toasted pine nuts. It was thick and hearty, and next time, I would do it with a ragu. 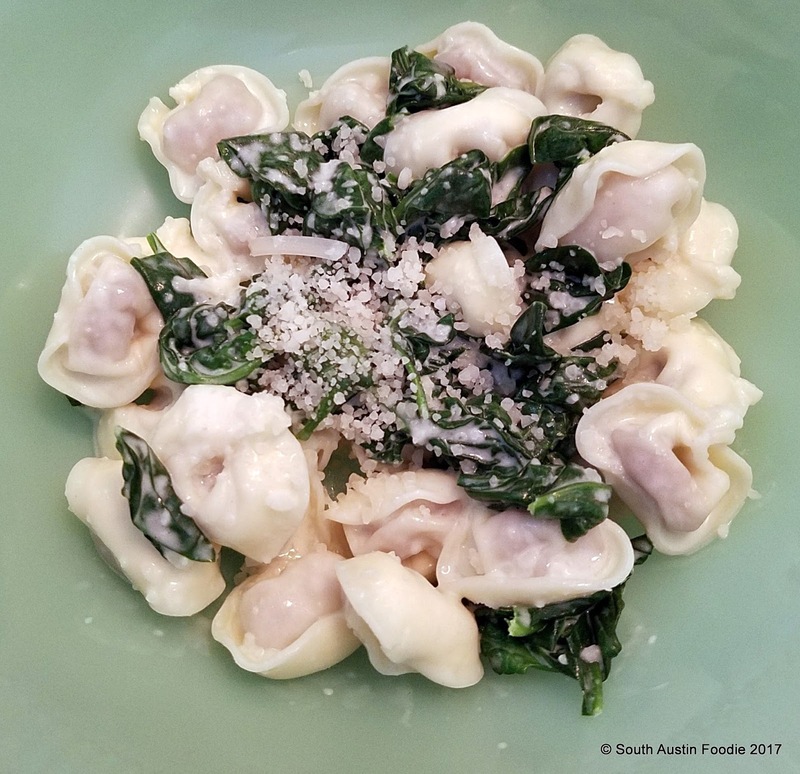 The tortellini I choose was filled with prosciutto and parmesan. I just tossed this with olive oil, parmesan, and wilted spinach. Owner Matteo said not to salt the pasta water, because the pasta was salty enough. Valid point! And I am sure he has all kinds of tidbits about preparing his different pastas. This is not your average grocery store pasta; everything is hand made and the prices and quality reflect that. And absolutely worth it! Benvenuto a Austin, La Dolda! Buon appetito!